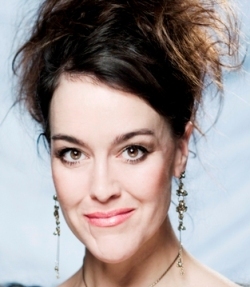 Half french and swedish from birth, this artist/singer and earlier oboist, came to Denmark in 1992 to pursue her education as an operasinger. Initially at the Royal Danish Conservatory of Music and then further on, at the Royal Danish Opera Academy. During her years at the Royal Danish Opera Academy, she interpreted the roles of Nerone (L’Incoronazione di Poppea), Siebel (Faust), Mimí (Bohème), Desdemona (Rossinis Otello), Zerlina (Don Giovanni). …and in 2005 she sang the role as the Mother in the “Operaverkstan”-company’s (Malmö Opera, Sweden ) setting of “Kasper Rosenröd”. Isabel Piganiol has worked for many opera companies, such as Ad Hoc, Den Ny Opera, Nordjysk Operakompagni, Exart, Malmö Operahouse, Opera Comique. Isabel Piganiol takes great pleasure in performing with the trio Nordic Sopranos, wich is completed by Berit Meland and Louise Fribo. The trio’s music is a mixture of Nordic/Scandinavian sounds, with the power of operavoices and a fusion of techno, ambient and new age. Again a great inspiration for a curious personality like Isabels. Isabel Piganiol was laureate at the international singingcompetition of Maria Canals, in Barcelona, in 2000.